Obituary for Lloyd H. Sanner | Hile-Best Funeral Home, Inc.
Lloyd H. Sanner, 89, of Seneca, passed away Wednesday morning, January 23,2019 at UPMC Northwest in Seneca. Lloyd was born on October 6, 1929 in Venus. He was the son of the late H. G. and Ester Capp Sanner. 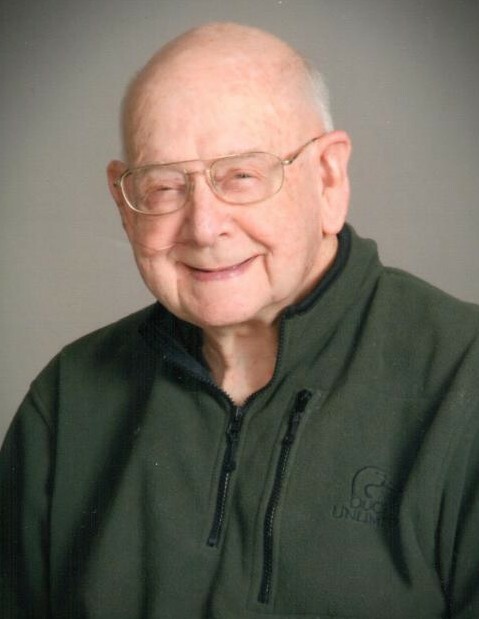 He was a 1948 graduate of Cranberry High School and was a member of the Rocky Grove VFD Auxiliary, a long time active member of the Cranberry Area Lions Club, and a member of the Seneca United Methodist Church. Lloyd enjoyed hunting, fishing and woodworking and attending basketball and softball games at the local high schools. He was employed for nearly forty years with national fuel gas company working as a mechanic and later a senior foreman. He retired in 1987. Mr. Sanner was preceded in death by his wife Marjorie "Chub" Free Sanner on February 5, 2011. The couple was married at the Fox Street Church of God in Rocky Grove on September 9, 1949. Surviving is his son Edward Sanner and his wife, Jeanette, of Cooperstown, five grandchildren Vicki Tarr and her husband, Jeff, of Cooperstown, Edward Sanner II and his wife, April, of Petrolia, Melissa Reyburn and her husband, Dan, of Cooperstown, Chad Sanner and his wife, Amanda, of Butler, and Tiffany Montgomery and her husband, Josh, of Seneca. Also surviving are ten great grandchildren, Amanda Herman, Zachary Snyder, Brandi Tarr, Jeffrey Tarr, Ashton Deal, Isabella Sanner, Alyse Sanner, Grascen Reyburn, Jordan Montgomery and Hunter Montgomery, seven great great grandchildren, Alex, Gabriel, Braelynn and Lily Herman, Jayde Snyder, and Keagan and Gavin Deal. A sister survives Nancy Jean Kline of Arcadia, CA, a brother in law Ed Perry of Oil City, as well as a number of nieces and nephews. In addition to his parents and wife, he was preceded in death by a son Roy E. Sanner, a granddaughter Jean Ann Sanner, a great granddaughter, Alyson Nicole Snyder, two sisters, Shirley Chenault and Mona Perry, and a brother in law George Chenault. Friends will be received at the Hile-Best Funeral Home, Inc. 2781 Rte. 257 Seneca, Cranberry Township, from 2-5 on Friday. Members of the Cranberry Area Lions Club will conduct a memorial service at 5pm followed by a funeral service, with the Rev. William E. Hastings, pastor of the Seneca United Methodist Church, officiating. Private interment will take place at Sunset Hill Memorial Gardens, Cranberry. Memorial contributions in Mr. Sanner's name may be made to the Seneca United Methodist Church 196 E. State Rd. Seneca, Pa 16346, the Cranberry Area Lions Club C/O Joe Cangemi 20 South West Blvd. Oil City, Pa 16301, or to Bridge Builders for the Roy E. Sanner Memorial Scholarship Fund, 206 Seneca St. Oil City, Pa 16301. For more information, or to send a condolence, please visit www.hilebest.com.